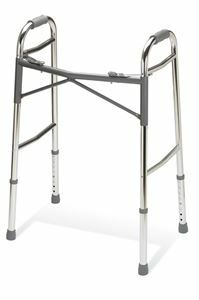 Heavy Duty Red Dot Walker by Medline Canada is designed especially for larger patients to provide them a comfort fit. Made up of lightweight Aluminium and comes with K-cross brace for extra support and durability. Each side of the walker folds independently. Can be easily folded to fit in less space. Can hold upto the weight of 400 lbs.